This letter was written by George Washington Preston (1839-1926) of Company C, 76th Ohio Volunteer Infantry (OVI). He rose to the rank of sergeant before mustering out of the service at Columbus, Ohio, in August 1864. George was the son of Jacob Preston (1814-1866) and Elizabeth Sophia Harding (1815-1893) of McKean, Licking County, Ohio. Two months after his discharge from the army, George married Catherine Haas (1840-1895) in Licking County. After the war, George and his wife moved to Illinois where he became a farmer. He died in Danville, Vermillion County, Illinois in September 1926. In this letter, written from Camp Sherman near the Black River, George asks his father to confirm troubling news he has heard from home regarding the Copperheads and their attempts to get Clement Vallandigham elected governor of Ohio. He tells his father that if he were home, he would kill “every damned one” of the “infernal” copperheads in Licking County. I seat myself this morning to write you a few lines to inform you that I am well at the present, hoping this may find you all the same. I received your letter last night of August the 24th. I was glad to hear that you [were] all well and doing well. There is a good deal of sickness here though I don’t think there is as much as there was some time ago. Ike has been sick for a few days though he is well now. 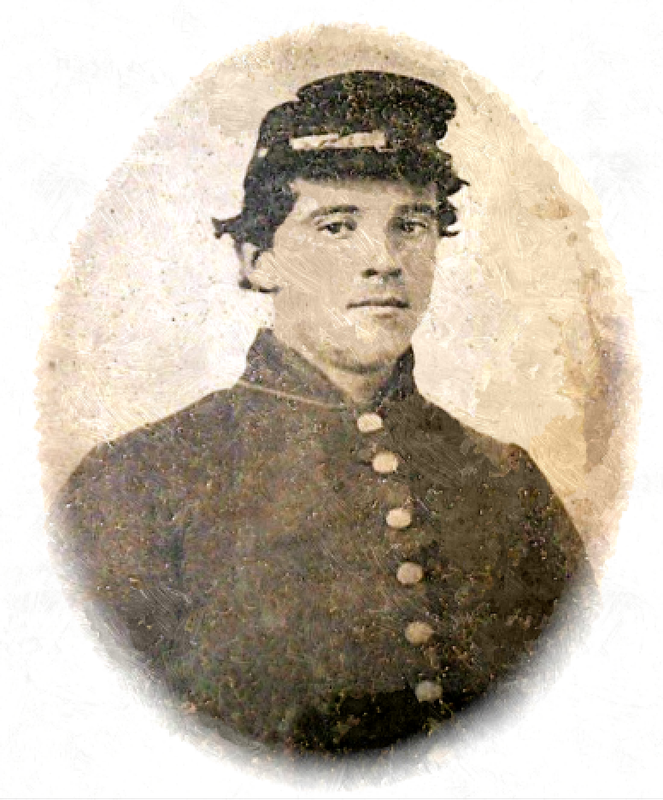 John P. Jones returned to the regiment day before yesterday. He looks very well now. Well Pap, I hain’t got very much to write about this time but I want [to] ask you a few questions. Has the infernal copperheads got a pole raised in Fredonia? I heard they had. If I was there I would take that pole down or die at the root of it. There is no use of us a staying here in this God-forsaken Sunny South a fighting and dying off like sheep to try to put [down] this rebellion when they are carrying on so in the North. It is a provoking thing for the soldiers to look when we hear of any of these big performances. It makes us feel like going home and kill every damned one of them. I don’t like to talk that way but I can’t help it. If I go on a furlough, I warn copperheads to keep away from me and keep their mouths shut for I am a fighting for my living these days — that is my trade — and I have got it pretty well learned by this time. And if I should come home, I wouldn’t come without army and I wouldn’t be afraid to use them if it was necessary for me to do so. There is a few men I know in the North that I would like to shoot if I had the chance. And I think if I was the Union men in the North, I would almost wait for the furloughed or paroled soldiers to come home to clean out these copperheads dens. I can pick 100 men out of this regiment and whip all the copperheads in Licking County. Let them be many or few, we can do it easy. I only wish they would let [us] have the chance of trying it on. I guess the soldiers hain’t a going to have the chance to vote this time and Vallandigham will be the next Governor of Ohio. I am afraid he will. He would stand no show at all if the soldiers got a vote. But then let him rip — it can’t be helped. But I think they had better elect John Morgan. Then they would have a traitor and a horse thief. Well Pap, there is no use for me to say anything more about them traitors up there for I can’t do anything for them while I am down here. But if I was home, I could serve them like a good many men has been served of their stripe. Well Pap, we was paid day before yesterday for two months. I got $34. I won’t send any home for awhile for I believe we will be paid again before long and then I can [send] it all together. I hope to God Miles kills three or four of rank copperheads up there before he comes back here. I will have to close for awhile. This about 7 o’clock after supper and I will in ____ to finish my letter tho’ I hain’t very much more to say this time. If I was there, I could say a do a good deal more but I am here and I will have to [do] my duty as a Union soldier and will while I have my health. Pap, we don’t fear the rebels in front of us for we can get to see them and know what they are doing. We can whip them every time and do it too. But them that is in rear, that stay at home where we can’t get at them, they are the men that the soldiers would like to have a chance. You need not be afraid about the old 76th [Ohio Regiment]. If they can get a vote, Vallandigham can stay where he is. But if we don’t, I don’t know how it will be. This war will be over some of these days and then what there is left of us will whip them devils the longest day they live. Well, I close for this time hoping to hear from you all soon. Don’t fail to send them likeness’s of the little boys. I am doing research on this George Washington Preston, I now live in the home he once owned with his wife, Catherine Hass-Preston in Gibson City, IL Dix Township.